Some have referred to it as a ‘social movement that changed history,’ while others say it was the culmination of a ‘quiet revolution.’ Whatever you want to call it, there is no doubt that the vote to repeal the Eighth Amendment to Ireland’s constitution, which criminalized abortion under any circumstances, reflects a changed Ireland. This Ireland has escaped the clutches of the Catholic Church, and its society is somewhat seeking to atone for everything it has done to Irish women in past generations, from the Magdalene Laundries and mother & baby homes, to the forced adoptions of children born out of wedlock. When Ireland voted overwhelmingly (66.5 percent) to decriminalize abortion up to 12 weeks of pregnancy, a cloak of shame and secrecy was suddenly lifted. 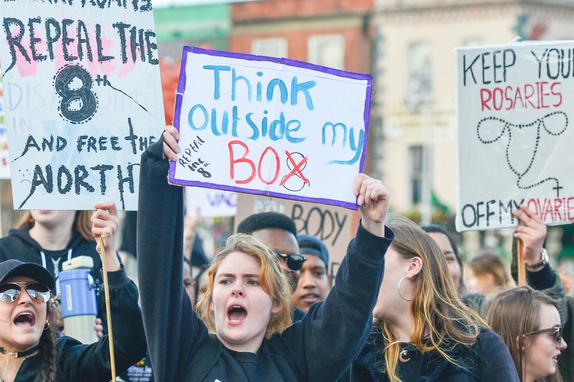 Over 170,000 Irish women have traveled to England for abortions since it was criminalized in the 1980s and the fight for safe and legal abortions has been gaining steam since. The death in 2012 of Irish dentist, Savita Halappanavar, from sepsis–which she contracted after she was denied an abortion during a natural miscarriage–was a catalyst for the pro-choice campaign. Fast-forward to March 2018 when the Irish government called a referendum on the issue of whether or not the country’s abortion legislation should be liberalized. Decades of campaigning on both sides of the debate boiled down to an intense, eight-week campaign where complex arguments on a divisive issue had to be debated and communicated to the entire electorate. The pro-choice campaign was headed up by Together For Yes, an umbrella group led by three organizations: the Abortion Rights Campaign, the National Women’s Council of Ireland, and the Coalition to Repeal the Eighth Amendment. With the support of over 97 organizations (including trade unions, teachers, doctors and grandparent groups), Together For Yes portrayed itself as modernizing and in step with international opinion, and insisted that repeal of the Eighth Amendment would demonstrate Ireland’s compassion for thousands of Irish women forced to travel to England for abortions. A united front and strong message alignment around having compassion for women in heart-wrenching situations led to the landslide vote to repeal. Notwithstanding support from countless celebrities such as Saoirse Ronan, Cillian Murphy, Bono and Niall Horan, it was ultimately the personal stories of women and couples who had been forced to travel abroad for abortions which swayed a significant portion of ‘undecided’ voters to vote yes. From the start, the Repeal camp highlighted personal and brave stories of women and couples who had traveled abroad to have abortions, which had a huge emotional impact on voters. Doctors who supported repeal were also prominent in the campaigning, which gave the Together For Yes message additional credibility. The pro-life/no campaign was dogged with ‘fake facts,’ received support from religious American organizations, and hired Cambridge Analytica alumnus, Thomas Borwick, to run an unregulated online campaign. The Irish electorate was subject to the same divisive tactics that worked so well in Trump’s campaign and Brexit; fake ‘facts;’ the denigrating of expertise; and deliberately gruesome imagery. Even with these tactics, the far right didn’t succeed when countered with heartbreaking personal experiences. The abortion referendum result paints a picture of modern Ireland – a headstrong and compassionate nation whose people won’t be influenced by foreign groups. Other campaign advocates could learn a lot from Together For Yes: that divisive rhetoric doesn’t always win, that tribalism can be defeated with truth and emotive narratives, and that evidence-based arguments can influence a voter like no other.